Hamilton's public transit system entered a long decline starting in the 1980s. Starved systematically of operating revenue year after year, the HSR cut buses, reduced service and shrank its annual ridership from 30 million in 1985 to just 20 million in 1994. After that, the inflation-adjusted HSR budget fell by another 25 percent between 1994 and 2005. Since then, funding has stabilized but not grown, while ridership has crawled up by only around one percent a year. Annual ridership today is only around 21 million, despite Council's commitment in 2001 to invest in transit and boost ridership significantly by 2011. Despite 15 years of high-level plans, Council has adopted no concrete strategy to grow the system and has no coherent vision of transit beyond regarding it as a social service for the poor. The HSR has been in decline for 30 years, and its management team has spent most of that period content to manage the decline. However, we have a new Transit Director, David Dixon, and based on his comments at yesterday's dog's breakfast of a General Issues Committee meeting, he is not content to continue managing the decline. Thanks to independent journalist Joey Coleman, you can watch the meeting in all its craptacular glory. The centrepiece of yesterday's meeting was a protracted and often excruciating debate over the fate of the two-kilometre bus lane on King Street between Mary and Dundurn. The bus lane started in October 2013 as a one-year pilot project, and a faction of suburban councillors is eager to kill it. The bus lane portion of the meeting begins at around the 40-minute mark in the video. It starts with a presentation by new transit director David Dixon, followed by three hours of questioning by Council and then another couple of hours of debate. But first, the tl;dr: four motions related to the bus lane were presented, and all four were voted down in close split votes. Ward 5 Councillor Chad Collins moved to eliminate the lane, Ward 8 Councillor Terry Whitehead moved to "suspend" it, Ward 2 Councillor Jason Farr moved to defer a decision to the February 6 meeting, and Ward 1 Councillor Aidan Johnson moved to direct staff to make the improvements staff recommended in the report. As a result, the bus lane pilot is still in operation for now; but Councillors will have a chance to make a final vote on the motions at next week's Council meeting. Dixon was an impressive gust of fresh air: a transit director who actually believes in transit and has a vision for how the city can choose to invest in a more prosperous, inclusive future. He fielded a seemingly endless array of gotcha-style questions from councillors without stepping into their traps. When Ward 5 Councillor Chad Collins asked when Hamilton will be ready for higher-order transit, Dixon replied, "It really becomes a political question." He drew a contrast between "the technical approach" of deciding when to upgrade to rapid transit and a more comprehensive, visionary approach. "Having the advantage of having worked through several different political environments, it really depends on where you as a city want to be. You can lead people to become a more progressive, transit-oriented city, or you can choose to let that evolve naturally. And so really it becomes your decision." If you want to know what "natural" transit growth looks like, just look back over the past ten years: flat or one-percent annual growth while our competitor cities roar past us. Acknowledging that the transit lane does impact rush-hour automobile traffic, he added that without transit, there would be 2,400 cars on four lanes rather than 1,200 cars on three lanes. "It's important to realize that having a good transit system does defer having to build new roads. It does result in less congestion, and it has a lot of positive social, economic and environmental impacts." By investing in better transit, Dixon argued, the City avoids future congestion and delays and avoids having to invest in more roads. It's about "how you want to see your city get shaped and grow and intensify." Collins was particularly insidious. He did his best to link the success of bus lane at increasing ridership along the Queenston-King-Main corridor with the viability of the city's rapid transit plan, only to oppose the bus lane. He is clearly trying to use the bus lane as a lever to topple LRT. Dixon told Collins, "This lane in its current configuration does not have a significant impact on our ability to operate a conventional transit. It really needs to be extended." Responding to Collins' question about how much time transit riders have saved with the bus lane, Dixon countered that what drives ridership is consistency. "When you're really moving towards choice riders, the most important factor is a consistent, reliable time of journey. That's what moves people. And so really, transit lanes are about providing that reliable, consistent ride." Collins kept repeating that the transit lane doesn't work. Dixon countered, "The current transit lane does work. It's just not as effective as it could be, and it needs to be elongated to be really, truly valued to the transit user." What Collins heard - what he was determined to hear from the very outset - is that the bus lane can be removed without harming the status quo, with which he is apparently satisfied. He parlayed the embarrassingly modest scope of the bus lane not as an argument to expand it but rather as an argument to eliminate it altogether. So much for choosing a more progressive, transit-oriented city. He clearly understands what is at stake. When Dixon warned that traffic will get progressively worse if we don't build transit capacity, Collins replied, "Most communities wait until they reach that crisis point" before investing in higher order transit, but Hamilton is not in crisis yet. Dixon modeled precisely the kind of leadership that I wish we saw in more of our City Councillors. "One of the reasons I'm here is I think Hamilton is in a very exciting spot in time. And so, where that timeline [of increasing congestion], how long it is or how short it is, really depends on what happens here from a growth perspective both in terms of residents and jobs, where you choose to intensify, and that will really determine what that timeline looks like. And the second thing I would say is, you don't want to get to the point where now you've got all the congestion and you're really scrambling." In his response to Ward 7 Councillor Scott Duvall, Dixon reiterated the need for leadership. "You're at 45 trips per capita [per year]. You know, the really good cities like Montreal are at close to 200. A lot of our peers are well above that [45 trips]. Some are below. We command seven percent of the modal share. So if you want to get people to shift to other modes of travel and really consider the avenues as moving people, not cars, and complete streets, that's really policy stuff that Council needs to take a position on. As I say, you can let it happen 'naturally', or you can choose to make Hamilton, at an extreme, a city in which you can live without a car." I repeat for emphasis: "That's really policy stuff that Council needs to take a position on." Council has paid lip service to precisely that policy through a tedious array of master plans over the past 15 years, but when it comes time to put those plans into practice, Council keeps falling back on a fearful retrenchment in the status quo. The novellist William Gibson famously said, "The future is already here. It's just not very evenly distributed." That is certainly true of cities, which are the very laboratories that invent the future. When it comes to urban innovations, some cities are ahead of others. Chicago, for example, built the world's first transit-only lane 75 years ago in 1940. The future came to Hamilton a bit more slowly: we opened our first transit-only lane, as a two-kilometre pilot project, in October 2013. But according to Ward 8 Councillor Terry Whitehead, who opposes the bus lane, "The future is not now." In other words, we should not build for the future until ... some time in the future. Whitehead's antics start at around the 1:51 mark on the video. After arguing that the bus lane was politically motivated by Council rather than generated by a staff recommendation, Whitehead then immediately contradicted himself by accusing staff of not being objective about the bus lane. "This report was driven by public transit staff that are advocates for the higher order transit and obviously they're looking through a singular lens when it comes to addressing these issues. So I guess the next question is: would it take, what would it take for public transit staff to say no to bus lanes? Would it be short of a nuclear bomb going off? Like, what would it take for public transit to stand in front of us and say, 'We can't tweak this, we can't fix it, but this is the right way to go'?" It is to Dixon's credit that his jaw remained in place throughout this line of questioning. Dixon reiterated yet again that it comes down to whether Council wants to lead on growing transit or just leave it as it is. "It's not just cars as it was in the '60s. It's about pedestrians, cyclists, transit, cars - moving people through those corridors." In a follow-up article, I will focus on those members of council who also demonstrated leadership on an inspiring vision for a more prosperous, inclusive, financially sustainable city: Councillors Sam Merulla and Jason Farr, who were on Council when the bus lane was approved, and newcomer Councillors Aidan Johnson and Matthew Green. I was commenting to a colleague how impressed I was with staffs ability to keep straight faced. I couldn't have done it. Especially when they had to clarify that yes, suspending the bus lane is the same as removing it. One important thing I've been noticing: people keep saying that consistency was the big win for the TOL. But at the same time, buses were stuck in the International Village snarl just like auto-traffic. That means that, on the balance, buses must made up the losses in the IV when traveling in the TOL. I mean if auto traffic lost 5 minutes in International Village, then logically bus traffic should too. But it didn't. Which speaks quite loudly: fix the IV traffic trouble and the bus-lane will show real performance. The more I think about it, the more I like Mayor Eisenberger's HOV plan - if we make it HOV, then we can extend it right to Eastgate and run it on Main too. Realistically, completely removing a car travel lane from the International Village isn't feasible at this point - ditto two on Queensdale. But an HOV lane? That would allow enough car traffic that it shouldn't truly strangle things (and if it does, it's the fault of drivers for too many single-occupant trips). An HOV lane end-to-end for the city would be a good compromise, and if we give into Whitehead's belief that we don't need a full TOL until 2000 riders, then it's a simple switch on that day to say "the HOV lane is now TOL". As someone who HSRs that route daily, I can tell you that there is no need for an HOV lane. Regular King buses are not slowed down by traffic. They're slowed down by the exigencies of the elderly and moms with prams, as well as those in motorized wheelchairs. As for the B-Line... Why on earth would moving this vehicle along faster be any kind of goal? This baby zooms along just nicely, thankyouverymuch. You're overthinking this. Not surprising, because it's an identifiable that would make everyone here feel like something's been accomplished, especially in light of how little actually is. To repeat: HSR riders are more interested in better service (more buses more frequently) than they are in carving two or three minutes off their Eastgate to James Street trips, or vice versa. If you can't provide consistency, increasing the frequency doesn't help that much. In Toronto, the major street car routes on king and queen are plagued by inconsistency because they have to wait for lights and traffic --- there are no dedicated lanes or signal priority. Although there are a lot of streetcars, they often end up bunched together so that waits are still long and very inconsistent. When a streetcar does come it is often full, and the one behind it is pretty empty because it is following too close. The same thing will happen in Hamilton I'd you try to do high frequency buses without a dedicated lane. And it makes no sense, when the bus lane already carries as many people as the other 3 lanes combined, to demand that the HSR somehow provide high frequency and consistency. Besides, if frequency is really so important that the bus lane has to be removed in order to focus on it, why has council not set aside any money to implement such features? Re: "HSR riders are more interested in better service (more buses more frequently) than they are in carving two or three minutes off their Eastgate to James Street trips, or vice versa." As a habitual HSR rider, I would like to think that a bus is capable of making a 10km trip (eg. Eastgate to MacNab) in under 35 minutes (ie. average speed 17 km/h, half that of other traffic and slightly swifter than an e-bike at mid-throttle or the average cyclist). The B-Line, as things stand, can cover the same distance in two-thirds of the time, but even that makes for an average of 26km/h. If Transit Priority Measures can shave five minutes off that trip for both routes, doing so would appear to open the door to the next best thing to more buses more frequently: the same number of buses more frequently. Remember the international village was always a freeway until the bus lane. The signal adjustments and transit signals proposed by staff will fix this slowdown. A transit jump signal at Wellington is all that is needed. As for extending the transit lanes, there is ample space to extend the lane on King and Main from the 403 to the Delta. Also, on Main through MacMaster where it widens to 6 lanes. Iirc, wasn't the 2010 IBI report's recommendation to stop running buses on Main through the Westdale area? All the passengers are getting off at the Westdale Village and the University, so running down Main is just wasting their time. Run down King and then into the University and then up Main. I tend to think that reducing any artery down to one auto lane per-direction isn't really doable. That's why I like HOV - it's still giving partial access to drivers to that other lane. Hi... That would be really awful and I can guarantee that many, not least myself, specifically use the 52 route on Main. That route is frequently full to bursting. The IBI report was quite brutal about simplifying routes. Essentially there would be only two routes from James to McMaster. The 1 and the B-line. That's it. Period. The 1 would run down King until it got to McMaster Bus Terminal. I can't remember if the B-line was going down King or Main. The 51 would be a McMaster to Meadowlands route, the 52 would become a McMaster to Dundas route, and various other Ancaster/Dundas routes would also rendezvous at Mac. So folks traveling west of Mac would have to transfer at the "mcmaster terminal". Which is appropriate because it would mean more frequent service, but it would be a tough pill. It recommended killing the west half of the 5 (merging features into the 1), killing the 3 (Cannon) the 6, 7, and 8, and the 12. All in exchange for upping frequency on the B-line. Completely axing the 6, 7, and 8 without any replacement was the biggest failure - killing service down to Aberdeen, or into Westdale North completely seemed extreme. At the very least I'd want a north/south route. Now, I could understand that kind of brutality if it weren't for the fact that it was quite generous with improved service on the mountain. Seemed quite unfair, given the bulk of the ridership. My favourite line is the bit about 'the 60's' That sums up Hamilton city council to a TEE. I'm sure when told it's not the 1960s anymore some of them thought "it's not??" Now is the time for Mayor Fred to explain to the new councillors that it's vital to heed the expert advice of their informed transit director and ignore the windbaggery of the couple who are just playing games. This can be a good council if the new councillors do the right thing and not cave to the immature nonsense. 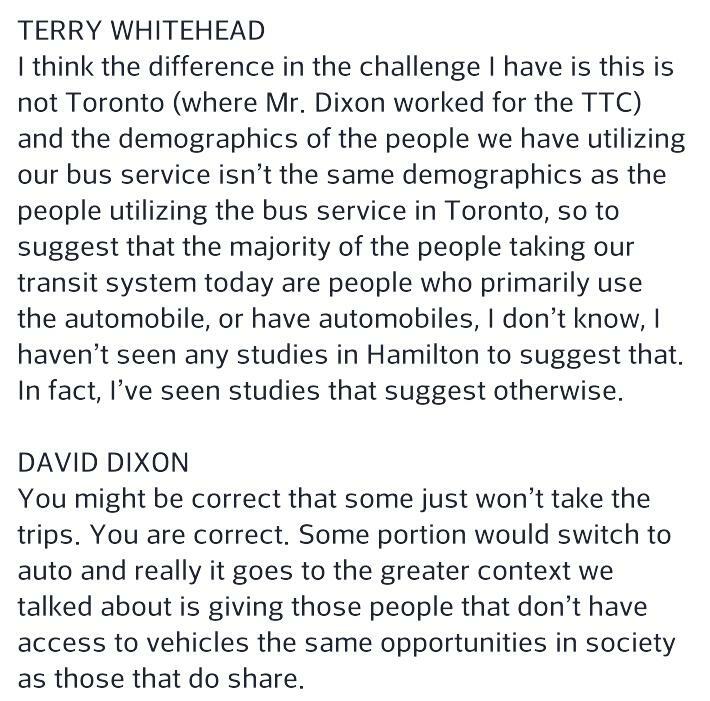 You left out the best part - Whitehead's response that this would not be the case because those people on the buses were Those People, and Those People don't have the means to drive. So we're okay to muck up transit for Those People. Wow. Let's reduce congestion by forcing those who can't afford cars to stop using public roads. How can he say this stuff and not want to kick himself? Thank you Ryan for bringng this discussion forward. I appreciate the headline to this article. It reveals a galling and glaring problem in Hamilton. City Hall Management. On the one hand, finally, we have a real transit advocate in charge but why did management wait 20 years to bring such an advocate on board? Sounds like an old boys' network that kept the previous administration in place. And by the way, we aren't out of the woods yet as City Hall Management asked for $400,000 to buid a gym for waste management workers. How could any manager submit such an outrageous request to city council when there is such a deficit in public infrastructure in this city??? If it's not a waste to provide amenities like this in the private sector, it's not a waste in the public sector. You can't nickel-and-dime your workforce just because they work in the public sector. That will only lead to lower productivity and less reliable workers, which will be costly in the long run. I'm all for the gym. A healthier workforce would be more productive and have fewer sick days, which is a huge expense the City is currently bearing. There needs to be a culture change with council, management and down to the workers. Encouraging fitness is a good start. Terry and Chad don't give two fs about transit. So what if the same number of people are moved in the bus lane versus the other lanes. So what if some of those riders are their constituents. They aren't as important as drivers. Ridership goals smidership goals. Just another day at the office for lifer councillors leaching off the public purse. Maria Pearson also ought to be applauded for her principled support for the bus lane. I think Whitehead seems like he could be convinced, maybe. Chad clearly being paid by someone to sabotage LRT, and I don't know what the he'll is wrong with Vanderbeek, Pasuta, Partridge. Probably all being paid/ all corrupt. Can you honestly believe anyone could be that stupid? My 3 year old would know what option would be better to support here. It has to be a conspiracy. That meeting was an exercise in bull*. Democracy doesn't work. No damn way those councillors are not being paid to sabotage the greater good. They have no valid argument to oppose bus lane or LRT yet the insist. Why?! Watching the Joey Coleman video feed is painful ... poor David Dixon. He's does his best, but some of our councillors have a thin ability to grasp basic logic or to abstract from examples given. Jaw-dropping at some points. Any chance we could find out outcomes of Mr. Dixons meeting today with Metrolinx??? Yes, you read that right. 498 people drive their cars to downtown Toronto each day. 498. Meanwhile, 70% of Hamiltonians work IN Hamilton with 25,000 in the immediate downtown business district. Many people work in Burlington and Mississauga, though, so they are driving in that direction... but as long as those GO stations dump you into an ocean of parking with mediocre transit and your job is in a 1-floor office park over on Derry Road that doesn't exactly help much. Which is why the Hurontario LRT might be a game-changer, mind you. Yes, this is a great point. Not to mention we have over 7,000 people commuting into Hamilton from Halton. GO should be two-way not just out of Hamilton. Also, LRT along our B-Line/ A-Line and Hurontario could drive a lot of riders between these two cities as economies continue to grow.